The sound of urban South Africa is often referred to as Township Jazz. It changed its basic form in the 1950s and early 1960s, however, and evolved into Mbaqanga. This genre was created from Kwela, Marabi, and African and American Jazz. Among the first Mbaqanga groups are Mahlathini and the Mahotella Queens, consisting of the lead singer Simon “Mahlathini” Nkabinde, the trio of the Mahotella Queens and the Makgona Tsohle band. Their most famous works are Meet the Mahotella Queens, Indoda Mahlathini, and Marena. They initially imitated American jazz, in time developing through African influences their own sound. Mbaqanga is the Zulu word for dumpling and was originally used by conservative populists to derogatively characterize this raw, unadulterated music; in the course of time this term was also taken over by the artists. The main elements include: gospel piano chords, acoustic guitars, double basses, saxophones, drums and a groove with a light rhythm. 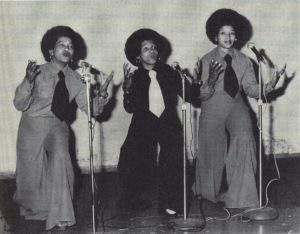 In the early days, a male lead was accompanied by a female quartet, the quartet often giving a lush touch reminiscent of American bands from the 1940s and 1950s. In the 1970s one finds also male leads with male chorus, resulting in a more mellow sound. These bands fall into the category of Mbaqanga-Soul. Later, there were also bands with female lead, such as Izintombi Zesi Manje Manje. 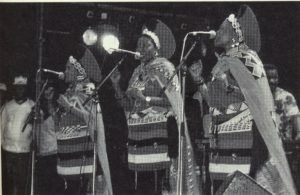 The Mahotella Queens – Johannesburg 1991, TJ Lemon. Meintjes, Louise: Sound of Africa! Making Music Zulu in a South African Studio. Durham/ London 2003, p. 219. The oppressive hopelessness of the population during the apartheid period is not to be found in the Mbaqanga songs. There is no anger, resignation or self-pity, as can be found in American blues, for example. This new rhythmic genre of music was apolitical in an apartheid-dominated South Africa. It adapted to the rules of censorship and gained popularity. It fused the energy-rich melodies with a positive attitude and a powerful drive. The rebellious, contagious energy of the artists animated the audience to carefree dancing, even in the dark times of apartheid. The rhythmic sound of rebellion made Mbaqanga so special. Izintombi Zesi Manje Manje – Johannesburg 1974, Jane Dlamini. Meintjes, Louise: Sound of Africa! Making Music Zulu in a South African Studio. Durham/ London 2003, p. 141. The audience for Mbaqanga consisted mostly of local jazz lovers from the working class. Mbaqanga became the basic form of musical nourishment, since it could be performed without being censored, and this resulted in its great success in a white-controlled industry. In the 1970s, the situation between urban workers and rural labor migrants came to a head. After the Soweto uprising of 1976, many performance venues in the townships were closed. The artists were not able to regain a foothold in the city or the countryside for a long time. In the 1980s, pop music and new musical genres arose, pushing Mbaqanga into the background. Many bands adopted the new styles, without however losing their unique sound. In 1986, Paul Simon brought together a group of township musicians. The product of this collaboration was the million-seller Graceland album, on which mostly Mbaqanga music can be found, and which received a Grammy Award. After apartheid, Mbaqanga experienced a renewed popularity. The early international careers of Miriam Makeba and Hugh Masekela had their roots in Mbaqanga. Another notable artist is Yvonne Chaka Chaka. Her hit I’m in Love with a DJ belongs to the subgenre Bubblegum.